In ancient Persia Anahita was considered the goddess of all water upon the Earth, and the source of the Cosmic Ocean. She rides a chariot of four horses, rain, wind, cloud and sleet. Her symbol is the eight rayed star. She was regarded as the source of all life. The Goddess of fertility, abundance, marriage, motherhood, love, birth and victory. Ancient Kings would be crowned by their Queens in Anahita’s temples, in order to gain her support and protection. In texts about ancient temples in the Persian region. There are references to Goddess Anahita’s union with Mithra the Sun God, the union of fire and water. The Conference of the Birds is a poem written in 1177 by Attar of Nishapur, it is a poem about the journey that the birds makes through seven valleys. The journey symbolises the stages any individual must pass, to realise the true nature of the Divine. I have based this piece of intuitive writing on a concert that I was blessed enough to attend on the 10.10.15 called The Seven Cities of Love and this piece transpired after the concert. The stage is set, the candles burning, the lights dim and the theatre is hushed quiet as the concert begins. The artist begins with the words of the poem and the air is filled with anticipation, as the musician takes his place and begins to play. Each pluck of his string sends a calling to the parts within that have remained dormant for many eons, my body is responding to the awakening of ancient longing that I had long since forgotten. As he sings an ethereal melody it catapults me into a different dimension of time and space. I am suspended within the realms of seen and unseen, bewildered yet longing to be drawn into the unknown. 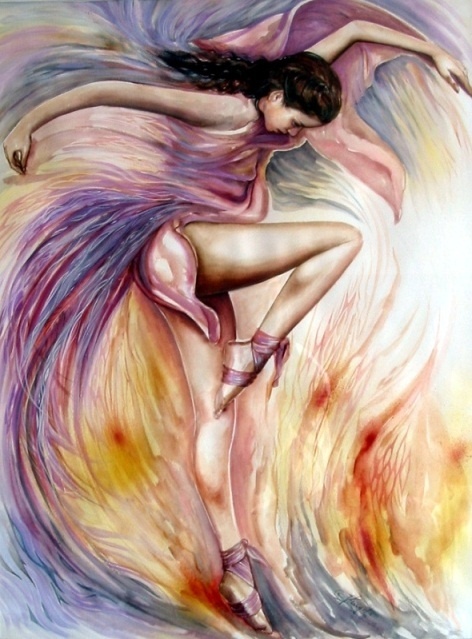 The dancer appears before me dancing, each movement, each sway calls to me and I am transfixed, enchanted. From the Soul of the dancer in her whirling to the rhythm of the music, She appears before me, in full form tall and celestial. She walks towards me Her eyes transfixed as She takes my hand and pulls me off my seat. The stage and the artists become united in the melody and dance, somehow there is no separation yet I am between worlds where time has no power or meaning. ‘You are dazzled to see me Dear Daughter, my Priestess, are you yet still trying to remember me your Mother. It is I Anahita you are my daughter and you lie in the slumber to your true essence. I have come to awaken you form this slumber, and to remind you of your birth right and sovereignty. For I am the queen of Heaven and Earth and you are My Daughter. With these words I see beside us two winged lions moving in unison with the chariot, and flying above us is a dove. We come to a standstill and the door of the chariot opens as if aided by some unseen force. She steps out before me and then holds out Her hand to aid me to step down. As we walk we are led by a peacock gliding before us, the deep colours of its magnificent form glowing in the light of the Moon. ‘Come my beauty.’ She beckons to me. I looked at her dumbfounded. She glances at me and bursts into laughter, Her silvery tones echoed into the darkness. With Her statement I was spellbound, in the feeling of deep Love, as if consumed and held within the heart of hearts. Cocooned wrapped up in this space that was suspended, I fall to my knees for I am so consumed by this unconditional love, that I weep. I feel pathways open up inside my heart that were closed by hurt and pain. Each wave of Love sends me into a spasm of opening, I lift myself like a rose facing towards the Sun, opening its delicate petals, as if in ecstasy with the presence of the moment, embraced by the warmth of its rays. As the dancer whirls I am left naked and trembling stripped of all that I had. I am full of nothing I roam around the dancer invisible, as she whirls each turn creates a vibration and I stand longing for all that I have lost, yet all have lost their meaning. There is nowhere to go, no one to be, as this realisation comes, there is no Anahita, there is no dancer, no dance, no music, no musicians. There is No –thing. No beginning and no end. I would like to especially name the Artist of the Sacred Dance Farima Berenji who has dedicated her life work to awaken the Feminine through the Sacred dance and her project the Lioness. My spouse and i were quite thankful when Chris managed to do his investigations while using the precious recommendations he obtained in your site. It’s not at all simplistic to just happen to be offering guidance which often people today could have been making money from. And now we do understand we’ve got you to be grateful to because of that. The specific illustrations you made, the easy web site menu, the relationships you make it easier to foster – it is most extraordinary, and it’s making our son in addition to our family consider that that idea is interesting, and that’s truly fundamental. Thanks for the whole lot!